So my band Haap has joined a site called SupaPass.com. Facebook is starting to get really sucky, especially for a band like ours that is very “social”. We like to stay in touch with everyone, and it is kinda depressing to see that facebook posts reach fewer and fewer of our “likers”. In return you get hear new songs a whole month before they are released to everyone else.. you get to hang out with us at live “virtual stage” events etc etc. SupaPass is still a fairly new platform. The site is in Beta stage so some parts of it might feel a bit unsmooth. But I met with the SupaPass CEO at MIDEM this year, and I think this “artist-support” model has a lot of potential… and it is a site run by really great folks (who are musicians themselves). So join us there! Right now the exclusive Haap song that you can only get from SupaPass is our new epic track “Avsted”. 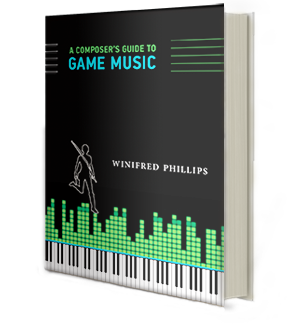 Today, my book, A COMPOSER’S GUIDE TO GAME MUSIC, was released by the Massachusetts Institute of Technology Press. It’s a huge day for me. In December of 2011, I was finishing up work on my music contribution to LittleBigPlanet PS Vita when my music producer, Winnie Waldron, turned to me and said, “You should write a book about game music.” Before that moment, it had never occurred to me that I might have something to share about my experiences as a game composer, so I initially laughed off her suggestion. She paused, and then casually remarked that I should go and look over all those game audio books I owned (I have a pretty large collection) and then maybe ask myself if I had anything to say that hadn’t already been said.